Edgar Allan Poe (1809–1849) was an American poet, short story writer, editor, and literary critic who is credited with inventing the detective fiction genre and with contributing to the emerging science fiction genre. He began his literary career with the anonymous publication of a collection of his poems entitled Tamerlane and Other Poems. He then turned to writing prose and spent the next several years working for literary journals and periodicals, becoming well known for his particular style of literary criticism. He served for a time on the staff of the New York Mirror, in which his poem "The Raven" was published. 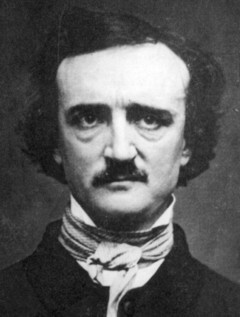 Poe's other well-known works include his stories "The Purloined Letter," "The Murders in the Rue Morgue," and "The Mystery of Marie Roget."